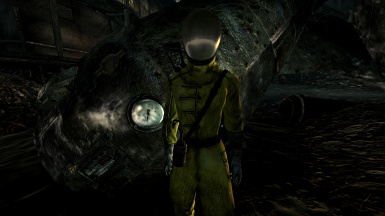 Fixes the issue of (modded) hair and jewelry clipping through the visors of the Environment Suit, Radiation Suit, Advanced Radiation Suit, Enclave Scientist Outfit, Chinese Stealth Helmet and, for FWE, the All-Purpose Science Suit. 1.5 - 2014/03/10 - Fixed esp's that had esmified masters. Edited the install instructions. 1.4 - 2013/10/31 - Fixed the All-Purpose Science Suit so it has the FWE effects. 1.3 - 2013/10/30 - Added the All-Purpose Science Suit to Fixed Suits FWE.esp. 1.2 - 2013/10/30 - Added the Chinese Stealth Helmet from DLC Anchorage. Added FWE versions of Fixed Suits and Fixed Suits Anchorage, giving the edited suits, outfit and helmet FWE stats and, for the Chinese Stealth Helmet, the appropriate FWE effect. 1.1 - 2013/10/16 - Added the Enclave Scientist Outfit. 1.0 - 2013/10/10 - Initial release, affecting the Environment Suit, Radiation Suit and Advanced Radiation Suit.